The Charmichael Show image courtesy of Chris Haston/NBC. The Carmichael Show on NBC has been renewed for a third season. The Peacock Network broke the news just ahead of The Carmichael Show season two finale, airing tonight. In the series, a young couple trying to make it in the city, Jerrod Carmichael (Carmichael) and Maxine (Amber Stevens West), move in together. They know what they want and are on the ball. Still, Jerrod’s family Bobby (Lil Rel Howery), his proud, religious mom, Cynthia (Loretta Devine), and blunt and blustering dad Joe (David Alan Grier), complicate their lives. What do you think? Are you a fan of The Carmichael Show on NBC? Do you plan to watch the third season? Tell us. 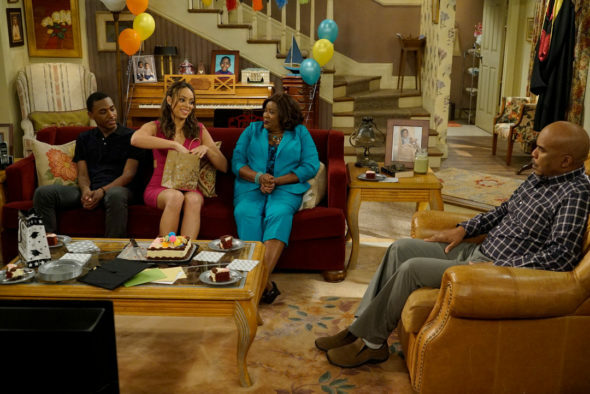 More about: The Carmichael Show, The Carmichael Show: canceled or renewed? The Carmichael Show: Will NBC Cancel the Comedy Series? I love the show and will continue watching. With David Allan Grier and Loretta Devine at the helm, they can’t go wrong. Great show! Thought provoking dialogue, very well-written and funny! Yes, it’s corny at times, but it keeps my family and me laughing, something America needs more of these days. LOVE this great show, the wonderful acting, the smart writing, the clever way that hot topics are addressed, every aspect of it. Hopefully NBC is much more sensitive to its Viewers than ABC, and Carmichael will be around for a long, long time. P.S. Loretta Devine is utterly … wait for it … devine! I’m not sure why they did this. It’s only renewed for 13 episodes, but it has a very strong chance of finishing below a 1.0 with 3 episodes to go. Someone said it might get nominated for an Emmy, but we’ll see. So NBC could end up with 2 shows with ratings below a 1.0 I think ABC has 2 shows with ratings below a 1.0 We’ll see what happens next season.